Head and neck cancer is actually a group of cancers that includes cancers of the oral cavity, larynx, pharynx, salivary glands, and nose/nasal passages. The National Cancer Institute estimates that it accounts for about 3 percent of all new cases of cancer diagnosed each year in the United States. In 2016, this is predicted to translate into about 50,000 new cases of head and neck cancer. Most head and neck cancers begin in squamous cells—flat cells that form the surface of the skin and line moist surfaces of the body like the lungs and digestive tract—and are referred to as SCCHNs. 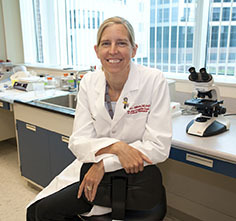 Recurrent or metastatic SCCHN that is not responsive to platinum-based chemotherapy progresses very rapidly, and patients have a very poor prognosis, according to Maura L. Gillison, MD, PhD, a professor in the Department of Internal Medicine at The Ohio State University Comprehensive Cancer Center – Arthur G. James Cancer Hospital and Richard J. Solove Research Institute, who presented results from the clinical trial that led to this week’s approval of nivolumab at the AACR Annual Meeting 2016. “Treatment usually involves single-agent chemotherapy. However, no therapy has been shown to improve survival for this patient population. New treatment options are desperately needed,” Gillison added. 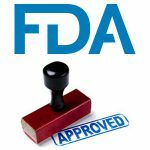 This week’s approval of nivolumab was based on results from the phase III CheckMate-141 clinical trial that were presented by Gillison and published later in The New England Journal of Medicine. In brief, they show that nivolumab improved survival for patients with recurrent or metastatic SCCHN that progressed after platinum-based chemotherapy compared with single-agent chemotherapy of the investigator’s choice. Median overall survival was 7.5 months for those assigned nivolumab versus 5.1 months for those assigned therapy of investigator’s choice. 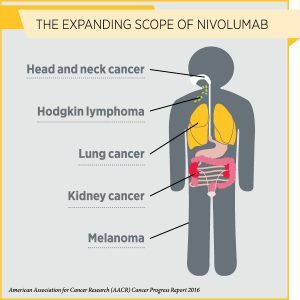 Given that nivolumab acts not by targeting cancer-specific molecules, but rather works by releasing a brake on cancer-fighting immune cells called T cells, it is hoped that further research will show that it has activity against additional types of cancer. In fact, Bristol-Myers Squibb, the company that developed nivolumab, announced Thursday that nivolumab had improved overall survival for certain patients with gastric cancer in a phase III clinical trial. The hope is palpable because some patients who have been treated with nivolumab have had remarkable and durable responses. Take Philip Prichard, who is featured in the AACR Cancer Progress Report 2016, for instance. In February 2013, Prichard was given just months to live after kidney cancer had spread throughout his body. He received nivolumab through a clinical trial and there is now no evidence of cancer in his body.